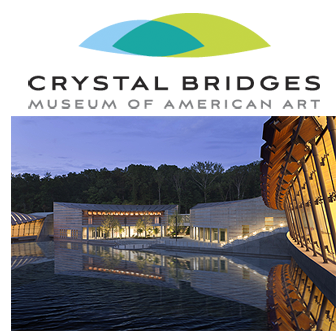 Crystal Bridges Museum of American Art describes one of America’s newest art museums but don’t let the name fool you. The word ‘museum’ often conjures images of dim lighting, partially concealed dusty artifacts, or stuffy buildings where guests can look but cannot touch. Be prepared…your visit to Crystal Bridges Museum will change the way you think about museums. It is a place that encourages exploration and compels you to question what you think you know about art. Crystal Bridges Museum of American Art is just a short, scenic drive from Eureka Springs. Crystal Bridges Museum of American Art opened in Northwest Arkansas in November of 2011. With more than 50,000 square feet of gallery space, the museum has a world class collection offering an overview of American art that includes masterworks by artists like Charles Wilson Peale, Asher B. Durand, Norman Rockwell, Thomas Hart Benton, Jenny Holzer, and Andy Warhol to name a few. The collection is impressive on its own but the museum itself will surprise you. Artfully perched in a beautiful ravine created by Crystal Spring, the museum was designed by reknowned architect Moshe Safdie. It is a place of significance…a place where American art and Arkansas landscape merge for a unique experience. James Turrell's the Way of Color. Turrell's Skyspace provides a view of the sky altered by stunning lighting effects that change with the light and weather conditions. Explore how the human eye interprets color and experience Skyspace. Discover how strong women have shaped the American spirit through art with a Gallery Tour. Learn new ways of looking at art in the Experience Art Studio. Interact with the art. Learn more about Art Totes or download the Crystal Bridges app on iTunes. Learn more about Education programs at Crystal Bridges Museum of American Art or visit the Official Eureka Springs Calendar of Events and see what is happening during your visit. Discover more Things to Do in the Greater Eureka Springs Region. 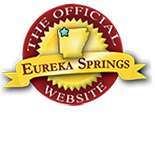 Be the first to receive news and specials for Eureka Springs and follow Eureka Springs Facebook or sign up for a monthly Eureka Springs newsletter. This entry was posted on January 16, 2012 by estcblog in Arts & Culture, Road trips, Things to Do and tagged Arkansas, Art Gallery Tours, Crystal Bridges Museum, history, Northwest Arkansas, Outdoor, photography.